28 so much to read writings, come to me, and I will bring you to the place where the book is which Thoth himself wrote with his own hand, and which will bring you to the gods. When you read but two pages in this you will enchant the heaven, the earth, the abyss, the mountains, and the sea; you shall know what the birds of the sky and the crawling things are saying; you shall see the fishes of the deep, for a divine power is there to bring them up out of the depth. And when you read the second page, if you are in the world of ghosts, you will become again in the shape you were in on earth. You will see the sun shining in the sky, with all the gods and the full moon. 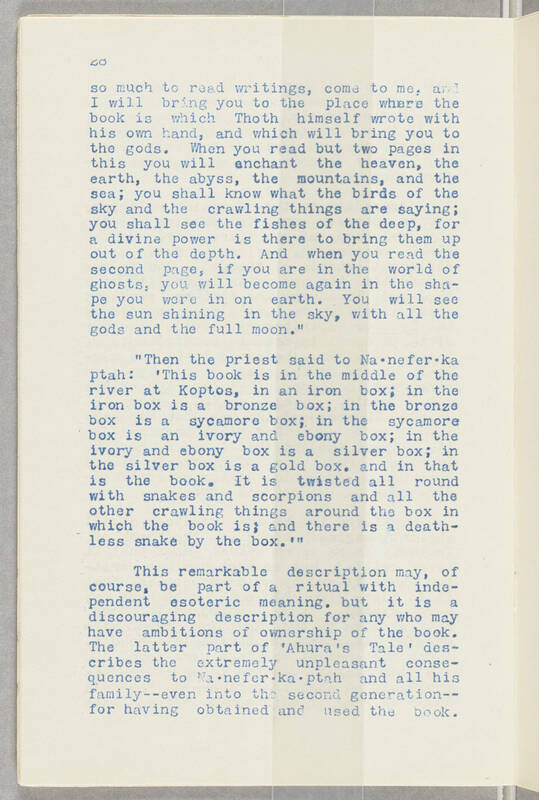 "Then the priest said to Na.nefer.ka ptah: 'This book is in the middle of the river at Koptos, in an iron box; in the iron box is a bronze box; in the bronze box is a sycamore box; in the sycamore box is an ivory and ebony box; in the ivory and ebony box is a gold box. and in that is the book. It is twisted all round with snakes and scorpions and all the other crawling things around the box in which the book is; and there is a deathless snake by the box.'" This remarkable description may, of course, be part of a ritual with independent esoteric meaning. but it is is a discouraging description for any who may have ambitions of ownership of the book. The latter part of 'Ahura's Tale' describes the extremely unpleasant consequences to Na.nefer.ka.ptah and all his family--even into the second generation-- for having obtained and used the book.